Hello everyone! Welcome to the February 2019 Reverse Confetti blog hop! Today I am sharing a card created with a stamp set from the January release. This is a really quick and simple card, but it has a look that packs a real punch! Sometimes it is the simple cards that really stand out. For this card I used the Patterned Hearts stamp set. I cut a white piece of cardstock to 3 x 8 and placed it in my MISTI tool. I chose one of the heart stamps from the set and placed it in my MISTI. I then stamped it across the panel with a bunch of different colors of ink to create a rainbow. The MISTI tool makes doing this really easy because you can keep the stamp in the same position and just move the paper. I popped up the heart panel onto a 4 x 9 card base with foam tape. For the sentiment I stamped the “happy heart day” stamp onto some black cardstock and embossed it with a white embossing powder. I then popped the sentiment strip up onto the lower right corner of the card. To finish up the card I added a sprinkling of sequins. Affiliate links have been used at no cost to you! This simply means that when you purchase something through one of my links, I make a small profit. This money helps me to be able to keep creating things to share with you. 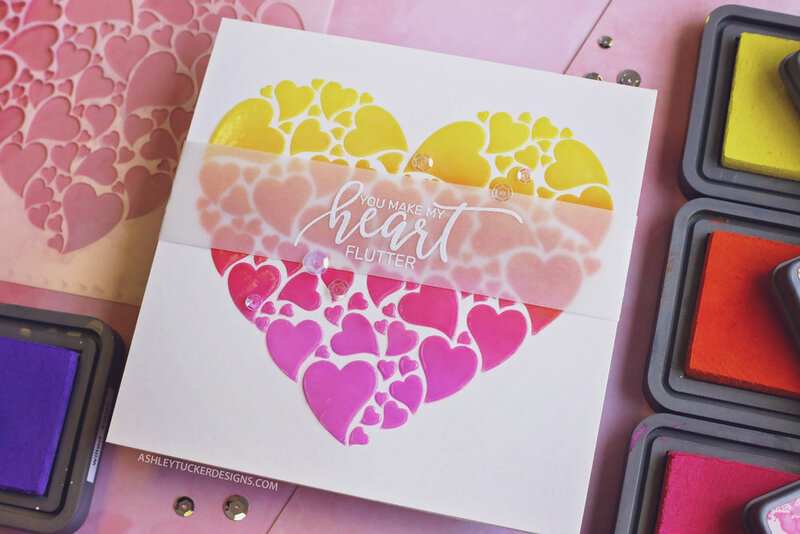 Today I am sharing a card featuring Gansai Tambi watercolors and the stamp set from Simon’s February card kit. I started by taping a piece of Canson watercolor paper to a board and then added more tape to mask off an area. I then painted over the area still showing with Gansai Tambi watercolors. Once the painting was done I used a bunch of the stamps from the Love Always stamp set and stamped them across the watercolored area with Versamark ink. I embossed them with Rose Gold embossing powder from Simon Says Stamp. For the sentiment I picked out the stamp which says “you are my soulmate” and I stamped it with Simon Says Stamp Intense Black ink right along the bottom edge of the watercolored area. To finish up the card I used a white gel pen to add some dots to the watercolored strip. I then filled in the outline hearts with Wink of Stella glitter. The last thing I did was add a bunch of different sizes of clear sequins. Today I created a really adorable valentine using the Cutieasaurus stamp set from My Favorite Things. I stamped the images from the set onto a piece of Neenah Solar White cardstock with Gina K Amalgam ink. I colored in the images with Copic markers and cut them out using my Scan N Cut. I then cut a heart shape from another panel of Neenah using the Scan N Cut. I glued the images around the heart cut out with Gina K Connect glue. I then added a piece of acetate to the back to make my shaker window. I created a background using two colors of Distress Oxide Ink (Abandoned Coral, Spun Sugar). I used foam tape to make a shaker area and filled it with Coconut Ice sequins from Lucy’s Cards. I then closed up the shaker and cut off any excess paper from the background. I took that entire panel and adhered it to an A2 card base. For my sentiment I stamped the “You’re a Cutieasaurus” onto Simon Says Stamp Slate cardstock with Versamark ink and then embossed it with Alabaster white embossing powder. I cut a slanted edge on one side of the sentiment strip and then glued it to my card. For the finishing touches I added a few sequins from the Simon Says Stamp Girl’s Best Friend sequin mix around the sentiment. I then went over the clouds with Wink of Stella. Finally I added some highlights to the images with a white gel pen. Hey everyone! Today Brutus Monroe is having a blog hop all about our favorite techniques. Some of my favorite techniques involve using stencils, ink blending, and shakers so I created a card incorporating all of those things. I started this card with a piece of Bristol Smooth paper. I blended lightly onto that with some Distress Oxide inks. I used the colors Wilted Violet, Abandoned Coral, and Worn Lipstick. I then took this months stencil from Brutus Monroe’s Stencil of the Month club and taped it down over that paper. I used the same colors of Distress Oxide ink over the stencil, darkening up those areas. Next I used a die to cut a circle out of a panel of Neenah Solar White. I glued a piece of acetate over that cut out to make my shaker window. I added a mixture of sequins to the blended panel and popped up the shaker window over that with foam tape. Next I took a piece of white glitter paper and punched a heart from it. I glued that to the middle of my shaker window. For the sentiment I stamped and embossed a stamp from the Love Bug stamp set with Alabaster embossing powder. I popped the sentiment strip up over the heart with foam tape. To finish up the card I took some of the coral colored sequins from the Party Time sequin mix from Simon Says Stamp and I glued them around the sentiment. Hello my friends! Today I am sharing a card that I made with a gorgeous stencil from Brutus Monroe. This stencil comes from this months Stencil of the Month club. To start, I taped a piece of 6x6 Bristol Smooth paper to a board. I then taped the heart stencil down on top of that. I blended over the stencil with a few colors of Distress Oxide ink. I used the colors Wilted Violet, Picked Raspberry, Spiced Marmalade, and Squeezed Lemonade. After finishing the ink blending I used a palette knife to spread some transparent texture paste over the stencil, right on top of the colors. I let that dry for a long time before moving on. I picked a sentiment from Brutus Monroe’s Love Bug stamp set and stamped it onto vellum with embossing ink. I embossed it with Alabaster white embossing powder. I wrapped that sentiment around my stenciled in panel and glued the ends to the back of the panel. To finish the card I first adhered the panel onto a card base. Then I added a few different sizes of clear sequins with Gina K Connect glue. Hello there! I'm Ashley Tucker and I am a Christian, a wife, a mother and a photographer. I am also really into card making, crafting, coloring, and designing. I basically love all things art related! Thanks for stopping by and checking out my blog! I really enjoy receiving mail and hearing from you! Affiliate links have been used above at no cost to you! This simply means that when you purchase something through one of my links, I make a small profit. This money helps me to be able to keep creating things to share with you. Please feel free to use my cards as inspiration for your own designs! I do this to help inspire you and help you! I do not mind if you copy my cards for your own personal use. If you decide to share a card you made that was inspired by my design on social media, please add a link back to me as your source. 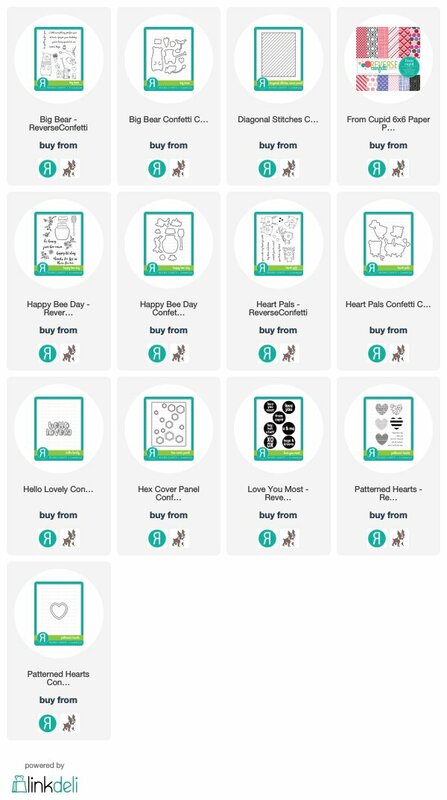 It is not okay to sell cards created from my designs. Feel free to contact me with any questions! All of my opinions are my own. If I do not love a product I will not recommend it. I do not receive any kind of compensation at this point for my videos. All of my supplies are paid for out of my own pocket unless stated otherwise in the video or post.